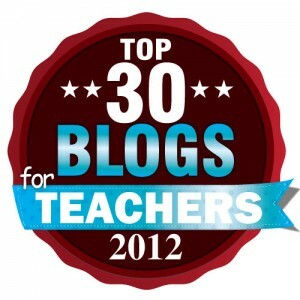 Be sure to check out my new article on Edutopia.org! For months I have been reading Tweets, blog posts, and forum postings that divide the world into two camps- those who like e-readers and those who think they will be the end of books. I admit- I was anti-e-reader for a while. But then I got my iphone and ipad and realized the wonder of being able to carry a few books with me at all times, without the heavy pile. I took my ipad on my cruise and read something like 10 books over the course of the week. I never would have been able to carry them all with me on the plane. So I am an e-reader convert! I also have a lot of students who move easily between e-readers and books. They have no preference, but I certainly see them reading more because their e-reader is always accessible. And how can I not love that? Needless to say, I absolutely ADORE the new Barnes and Noble Nook commercial called “Read Forever”. We can all get along. Just read forever. Now that I am teaching high school, I realized I had to change the name of my sort-of-monthly title sharing posts. I realize I haven’t updated since last winter, but that is changing. Now that I can use Goodreads with my students, I have constant access to what they are reading, what they think about it, and what they are planning to read. It’s not as good as a one-on-one conference, but it helps me out a lot. So without further ado, I introduce “Fresh Reads for Freshman”! Genghis Khan and the Making of the Modern World– My students attend a magnet-like school and many of them read above grade-level. Their interests are also very particular, so I have a wide variety of books being read. Many of my students, especially boys, gravitate toward nonfiction. This is just one of the many nonfiction books being read in my room at this time. I am also seeing copies of Germany 1945: From War to Peace, The Dangerous World of Butterflies: The Startling Subculture of Criminals, Collectors, and Conservationists, and Baseball in ’41: A Celebration of the . Nonfiction is definitely more popular with my freshmen than it ever was with my sixth-graders! But there is also a lot of fiction being read. My ARCs are traveling around the room like wildfire. (Sidenote- ARCs are magic. Tell a reluctant reader that they can read a book months before anyone else, and all of a sudden they are are salivating over the book. Coupled with how competitive my students naturally are, and it’s a perfect match!) Right now, I am watching my ARC of Matched fly through the room. Every few days I see it on another student’s desk. And they are raving about it! Also making the rounds? Daisy Whitney’s The Mockingbirds. And I haven’t seen my copy of Sapphique in ages! One of my students picked up my copy of Revolution by Jennifer Donnelly. She couldn’t stop talking about it and convinced me to move it to the top of my pile. Now, I can’t put it down! And the most popular series? The Hunger Games! My students are devouring the entire series. It’s awesome! If they finish a lesson early they may read one of the following books from the program’s library: The Tiger Rising, Johny Hangtime, Bird, The Boy Who Saved Baseball, Night of the Twisters, Every Living Thing, Locomotion, Granny Torrelli Makes Soup. Only these 8 books – OR –They may read either the Kids Discover Magazine, Cobblestone Muse, Faces or Odyssey Magazine or Footsteps. Of course they (the program) have picked the approved topic such as Bridges, climate, fairy tales, Chemistry of chocolate, or Folk Art. On day 5 and 10 if they finish their computerized lesson they are to go to the online book cart (part of the program) and pick one of their selections and read it and test on it and then go to their online books (part of the program) and read a passage and test on it. If at anytime they finish all of the above the only other approved book is their required novel from their Language Arts class. WHAT?! First of all, there is nothing wrong with The Tiger Rising, Johny Hangtime, Bird, The Boy Who Saved Baseball, Night of the Twisters, Every Living Thing, Locomotion, Granny Torrelli Makes Soup. However, there is no way on earth those eight books will connect with all of the program’s students. They are great books but students should be able to choose from the thousands and thousands of middle grade and YA books out there to read. Who chose those 8 books? Which students are they meant to speak to? What about the students who won’t connect with those books? And then if they happen to finish all those books they can then read their novel for language arts and only that class novel. Students can’t be trusted to choose their own books? I spend the beginning of each year teaching my sixth graders how to choose books. For a small handful of students the process can take almost the whole year. However, they are capable of choosing appropriate books that they will enjoy once they are taught how to choose those books. How do we expect students to grow into lifelong readers if we teach them that they can’t handle the responsibility of finding their niche in the world of reading? The program Sandra’s district has implemented actually states that all pleasure reading is to be done at home. What a laugh! It’s the rare student who will take time out of their night to read a book for pleasure if their teachers don’t model the importance of pleasure reading in school. If we don’t show that reading deserves to be done and is important in our daily life then students won’t make that judgement on their own. My students read independently every.single.day. I make sure to carve the time out of our school day and they then carve out time at home. It’s a reciprocal relationship. If it is important to me it becomes important to them. But what upset me even more in Sandra’s post were her anecdotes about the other teachers in her district who are blindly accepting the canned program. In fact, they are glad to have it. Upon hearing that Sandra read books for her students over the summer, they actually responded with disbelief and almost-horror. Why on earth would a teacher do that “crap”, as one of the teachers so eloquently put it? You want to know why Johnny and Johnae can’t read? We have too many teachers willing to let administrators spend thousands of dollars for canned programs that list the benchmarks and what to say and even have the lesson plans written up. That way they don’t have to do anything. We need to stop this. There is no better way to get students reading then putting books in their hands. BOOKS. Not basal readers, not graphic organizers, not workbooks. Actual, physical, paper-and-glue books. 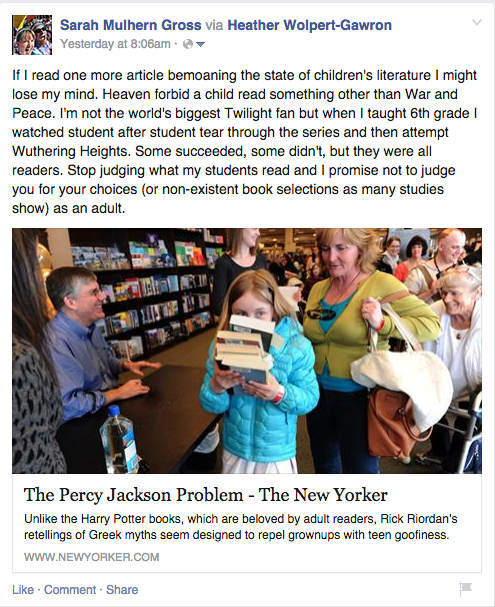 Real novels and stories, not those written specifically for test prep and canned programs. Literature. For the past three years I have been growing readers in my classroom, as Jen says, and I do it with nothing more than a classroom library and booktalks. My students still learn and use the comprehension strategies, they write about reading, they hold conversations about their books. In fact, they go above and beyond what the scripted programs ask for. I have extremely high expectations for them and they meet those expectations every year. Does this mean I have to write my own lesson plans, read professional literature, keep up on children’s literature, and do a little more work? Sure. But it’s what is best for my students and it’s what has been working for the past three years. How can you be a reading teacher and hate reading? How can you think that reading from a script and never deviating from it is what’s best for our students?! If all we need to teach kids is a script, then hire a robot instead of a teacher. Or sit kids in front of a computer. All you will get is a generation of test-takers. Sure they’ll pass the standardized tests but they won’t be lifelong learners and they certainly won’t be readers or writers. And where would our world be without readers and writers? Whether you are dealing with dormant readers, developing readers, or underground readers- literature is the way to go. In fact, it is the only way to go. As teachers we need to get the message out to administrators and politicians that we don’t want these programs! Instead, the millions of dollars spent annually on reading programs should be funneled to school and classroom libraries. We should be booking author visits, connecting students with real live writers and creators. We should be buying novels, graphic novels, realistic fiction, non-fiction, every genre of books for our schools. We should be exposing students to real text with real stories. Not some 5-paragraph garbage written for a computer reading program with 10 multiple-choice questions that dig no deeper than recall on Bloom’s Taxonomy yet we call it “everyday text”. Ridiculous. Everyday text is made up of what we really read everyday- books, brochures, recipes, signs, newspapers, and so much more. Books are the answer. Real reading makes readers. I’m not a baseball fan. In fact, you could say I am the exact opposite. If you wanted to somehow put me to sleep, stick me in front of a TV with a baseball game on. I’m more of a soccer, basketball, Olympics girl. Fast. Aggressive. High-scoring. That’s how I like my sports. However, I read an inordinate number of baseball books because I teach in a baseball town. Every year, at least half of my boys are baseball players. They love to read books about baseball, baseball players, and baseball history. So this past year I read (and loved) Alan Gratz’s The Brooklyn Nine. At the end of the book, Gratz includes an afterword with historical information pertaining to each story in the book. It was there that I learned there have only been 17 perfect games in MLB history. Today, I opened my computer to read the headline Buehrle tosses first MLB perfect game in 5 years. Before I read the article, I immediately thought to myself, “Wow! Now there have been 18 perfect games! How cool would it be to actually pitch one of those 18 games in the last 100 years?” Not exactly what you’d expect from someone who has never watched an entire baseball game all the way through, huh? More importantly, not what you would expect from the the girl who spent the one season she played softball making daisy chains in the outfield. Before reading Gratz’s book I never would have known this information. I probably would not have even clicked on the link and read the article. But because I read The Brooklyn Nine I was interested in the story. Reading that book led me to read the article from Sports Illustrated today. And now I know that there have only been 5 pitchers in MLB history to throw a perfect game and a no-hitter. Isn’t that exactly what we want our students to do? Read, build schema, and then go out to read and learn more? And this can happen with any book. I’ve seen students go out and research synesthesia after reading Wendy Mass’s A Mango-Shaped Space. Students who read Cryptid Hunters read non-fiction about cryptozoology. So on and so forth. There are no bad books. Sometimes I have parents who think that sports books are a waste of time. Or horror. Or humorous books. Or magazines. It goes one and on. But here’s the magic of reading: fiction leads to reading more non-fiction-whether it is non-fiction books, articles on the internet, magazines, or any other informational reading on a specific subject. It’s just as likely that readers of non-fiction will seek out fiction books on similar subjects, or more informational texts (in a variety of genres) about the same subject. Reading begets more reading. There’s no more organic way to get kids to read than to just allow them to read what they want and to continue reading what they enjoy! Even better? All that reading builds up background knowledge and schema. Students with more schema do better on standardized testing because they have the necessary background knowledge. More importantly, students with a large array of schema will connect to more books, more subjects in school, more teachers, and more people. They are more well-rounded..